Race series design is an interesting topic, to me at least, because you’re looking to define the a car design with the purpose of orchestrating a good race event. It sounds convoluted, and it is, but that’s the beauty of it; a competition between the series organizers and its competitors; each with their own, often opposing goals (one to provide close racing, the other to win). There have been some pretty interesting attempts over the years to change some parameters for a field of racecars, for various reasons. The 2009-2013 regulations for F1 made the front wing wider, to pick up clean air sucked around and inwards by the taller rear wing of the leading car. This meant less front downforce lost by the following car, and increased overtaking opportunities. Nascar, for instance, had a period where the optimal strategy was bump-drafting; literally pushing the car ahead of you around the ovals. This lead to 2-car trains working to separate themselves from the rest of the field – not very competitive or interesting! Their solution was to reduce the size of the cooling intakes, hoping that the temperatures would build up too high on the following car. In reality, the teams just designed their car to run at higher sustained temperatures, and when they pulled out into fresh air, the small intakes meant that thermal shock (going from hot to cold very quickly) wasn’t as bad as before. Mission Failed. Formula 1 has flip-flopped repeatedly in terms of series design, held back by one big problem – nobody knows what F1 is supposed to be. The cars on the grid aren’t the worlds’ fastest cars, nor are they designed to be – no wheel covers or ground effect tunnels means they’re about twice as draggy as they could be. They’re not great at racing each other – Monaco 2018 proved that you could win with a 200-horsepower deficit because close racing and overtaking is extremely rare. They don’t even sound that great. They do look vaguely like the cars from the 1980’s though, which seems to be all that changes. The 2009 regulation change seems to have been a fluke; and whoever was responsible promptly fired, because since then every change has made races less competitive and more boring and predictable. Another problem F1 has is the lack of exposure for engine manufacturers with non-factory teams. Did Renault really get it’s time in the spotlight with Red Bull during the championship years? A simple solution would be to have the teams run in their engine suppliers’ colours during test days; instead of the blue Red Bull, a gold/yellow/white/black paintjob over the same pattern would give Renault far more exposure. Like many things in life, series design is a case of wanting three things but only getting to pick two. 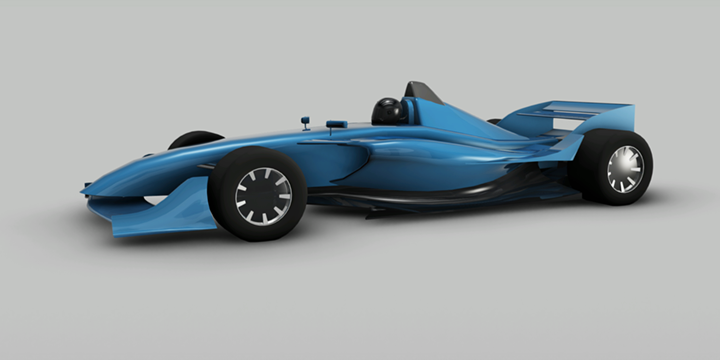 In this case, it’s the style and appearance of the car (aesthetics, sponsorship placement, readability on TV at high speeds), the functionality of it as a racing car (how well it can overtake, how competitive the series is, reliability and cost to keep the track full of cars) and the performance of the vehicle (top speeds, cornering speeds, lap times, pit lane work speeds). Sports, games, etc I define as competition for entertainment. That means that, by definition, you MUST go for the vehicle’s functionality as a race car. The remaining choice then is how you balance aesthetics and speed. The trick here is to get the racing functionality to do double or triple duty; designing it in such a way to be visually pleasing, provide clear, readable sponsorship area, and even provide performance in a way be freeing up other areas. In this case, the technique I use is to push the center of pressure way back over the engine using large fins leading up to the rear wing. This, along with modest tunnels means a huge amount of downforce right over the CoG, a high degree of aerodynamic stability from the drag being generated so far back, and a reasonable amount of yaw self-righting due to the side area being so large near the rear wheels. Of course, the increased surface area can be used by sponsors looking for more visible space on the car. This, combined with wider front wings to catch clean air drawn in from around the leading car, mean that any chasing cars lose very little front-end downforce, and almost no yaw stability when following closely. On top of that, the following cars shed a significant amount of drag in the slipstream, drawing them even closer on the straights. I’ve designed 4 levels of car here. 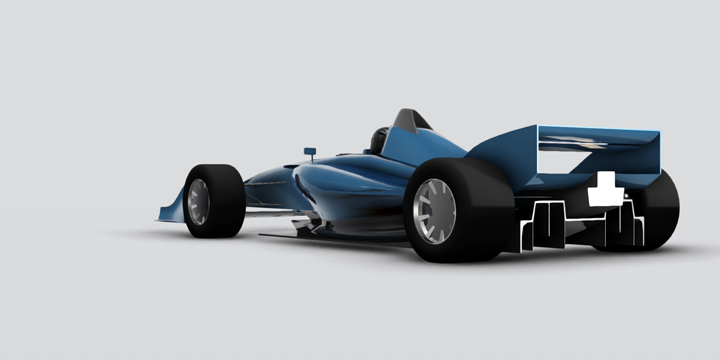 The blue Formula 2000 would be the beginner, state or junior series; a 2 liter engine and simple bodywork keeping the costs down. As an entry series it would provide an ideal starting point for young drivers or amateur racers into the world of close, competitive open-wheel racing. 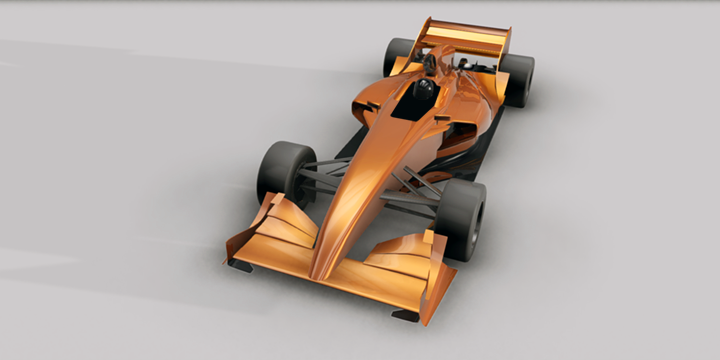 The orange Formula 3000 would be for higher level state or junior national championships; with more power from a 3-liter engine and higher levels of downforce upping the speeds considerably while maintaining close competition. At the top of the national/continental ladder is the Formula 5000, shown in silver here. These would be the premier national open-wheel race cars. Combining a much stronger 5-liter engine with more powerful ground effect downforce they would still be able to provide close and unpredictable racing due to having the same core design philosophy. 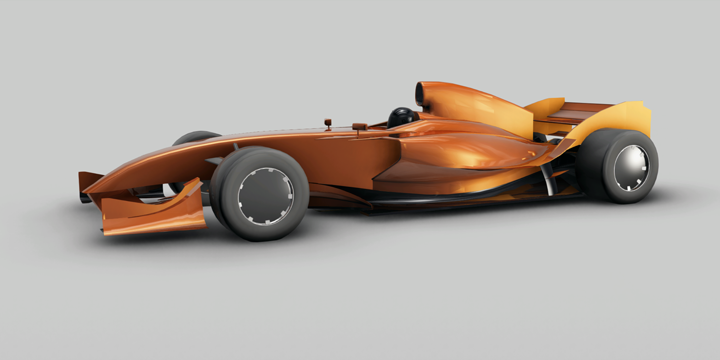 The world series, available for the best drivers from each nation, would use the Formula 9000 cars. Based on the F5000 chassis and mechanicals, the F9000 features enclosed wheels and a cockpit canopy for a massive reduction in drag, deeper ground effect floor tunnels for greater downforce, and an active, wider rear wing and dive planes giving greater adjustability when following another car. These combine to give a drastic increase in speed, while maintaining the controlability and handling required for close racing. Another aspect of racing is the track design, and honestly, most modern tracks are severely lacking in this regard. Of course, while the site depicted is pure fantasy (over a bridge in a seaside city with amazing elevation changes?) I did ensure a good layout was at its core. Starting halfway along the beach straight in a clockwise direction, drivers approach the flat-out turn 1 then a climb up the first overtaking zone all the way to turn 2. Sequencing several corners of the same direction, then alternating between those sequences leads to multiple viable racing lines; and hence more possibilities to not just follow another car closely, but to run alongside or even in a pack for extended periods. This is combined with a climb out of a medium speed corner, over the bridge, into a hairpin turn; giving cars a huge advantage through slipstreaming. The final sector of the track deals with smooth banked corners where cars can run 3-wide, and several sharp multi-apex turns that favour drivers who can punch over each apex, before ending in another hairpin and onto the main straight.